It all starts, as many things do, with Thomas Edison. In autumn 1897, his train steamed into New Mexico Territory, and shortly thereafter, the Wizard of Menlo Park captured the first moving images of the Land of Enchantment. “Indian Day School,” the product of his brief endeavor, clocks in at about 25 seconds. Children file out of the Isleta Day School, toddle past the camera, and march back into the schoolhouse. With that, a star was born. Since then, New Mexico has co-starred in nearly 1,000 movies and TV shows. 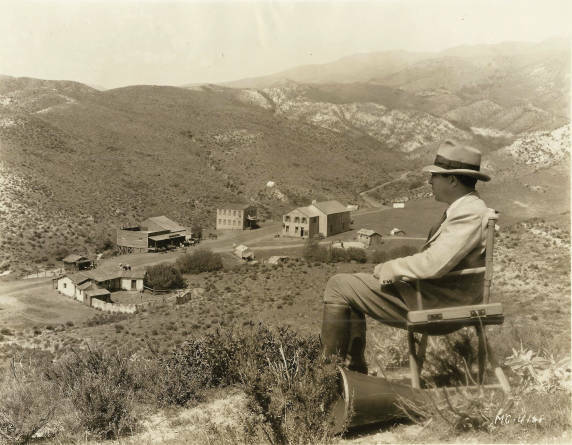 The breadth of it, from silent movies to the golden age of premium cable, fills the frame of Hollywood Southwest: New Mexico in Film and Television, an exhibit opening February 25 (through August 27) at the Albuquerque Museum of Art and History. Entering under a mock movie theater marquee, visitors find papers, posters, and props from Roy Rogers’ and Gene Autry’s days as singing cowboys, Johnny Depp’s time as Tonto, and Brian Cranston’s stint as Albuquerque&apos;s most infamous chemistry teacher. Once you pass the hulking vintage projector on loan from the KiMo Theatre, you experience the different eras within 120 years of film production in New Mexico: early documentaries of Indian Country, brash westerns, cult movies, modern sci-fi and superhero blockbusters, and contemporary television. You can get up close and personal with Thor’s armor and the gun that S.H.I.E.L.D. agent Phil Colson shot Loki with in The Avengers, or the coveralls and gas masks that Jesse Pinkman and Walter White donned in Breaking Bad. Scoured from universities, private collections, studios, and eBay (guest curator and UNM history professor Paul Hutton confesses to being a “hopeless collector”), the sheet music, postcards, lobby cards, costumes, and even screens showing “coming attractions” illustrate the historic range of film and TV in the state. “I think ‘exotic’ is the key,” Hutton says of New Mexico’s filmmaking appeal. Through the 1960s, westerns made up nearly a third of all Hollywood movies, and New Mexico’s unique and varied landscape supplied perfect backdrops to Tom Mix’s daring silent films and John Wayne’s shoot-’em-ups. After the westerns faded, Hutton says, productions kept coming, in part thanks to a welcoming and established workforce and tax incentives. And it doesn’t hurt that a lot of producers, directors, and actors would rather spend a few months in New Mexico than somewhere else.